Beautiful. He’d called her beautiful. Nobody had ever called her that before, except her mother, which didn’t count. Mothers were required to think you were beautiful. 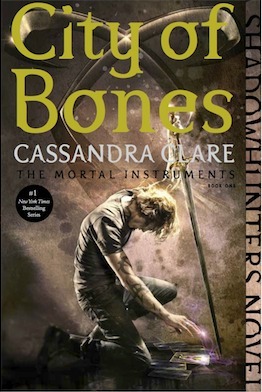 City of Bones might not have been perfect, and it might have held true to some of the mid-2000s writing clichés I expected, but I was so pleasantly surprised by how much this story sucked me in, and how quickly I became invested in these characters’ lives and the outcomes of their struggles. More than anything, I was stunned by how quickly I fell in love with Jace and the Lightwood siblings, as well as some of the lesser-seen side characters, like the magnificent Magnus Bane and the kindly, brave Luke Garroway. I’m so glad that I’ve already got the entire TMI series waiting on my shelf, and I miiight have already ordered the TDI trilogy, if that tells you anything about how excited I am to continue this story! I’ll just always be butthurt that I gave my whole series to a friend 😭 awesome review though! YESSS! You totally should! 🙂 I would love to discuss with you! Love your review. I cheated and started watching the show and haven’t read the books yet. I also tend to like the arrogant bad boy with a heart. Show wise, I love Magnus more than anything. He is my favorite. I hope he’s the same way in the books once I finally get around to reading them (I also have all of them here). Thank you! I’m saving the show until I finish TMI and TID, but I hear he’s really great in the show. He was introduced in the first book and I loved him immediately! He’s really a huge standout character for me. Great review! So glad you enjoyed this book. I am reading the series but I haven;t finished it yet. I totally understand you feeling how you do about Simon, but just you wait! He develops into probably one of my favorite characters in the series! I was never a fan of the whole love triangle between him, Clary, and Jace and at first he was just kinda used as an opposite to Jace, but he really develops into his own person later on. Hope you enjoy the rest of this series! Awww, nice! Thank you, Elise! I really think I will! I agree with you on so many of your points! I just finished City of Ashes, like just now, just before I read this post. These books aren’t the best but I just can’t seem to get away from them. I’ve got all the books on my shelf and still haven’t read them yet but they’re the one series I really want to finally read this year. I’m so glad you enjoyed it as I have the same reservations you do so it’s encouraged me to read them sooner rather than later! Yay! I hope you enjoy them as much as I have so far. I’m working on book 2 right now and I like it, too! I hope you get the chance to pick it up again sometime! 🙂 Thank you.